Flora Day: A Very Personal View! Flora Day: The Morning After! `Water Pumps` played an important part in the towns history. 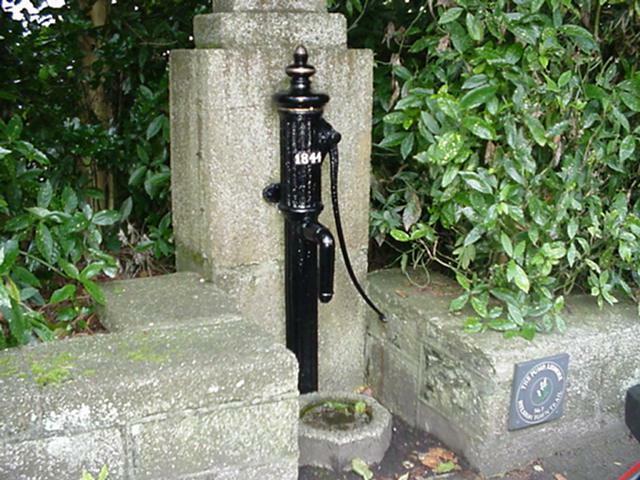 Long before the Helston & Porthleven Water Company came into existence the only means of water supply was by pumps, or in the lower parts of the town, running streams or `shoots`. But `Pumps` are what I have in mind here! Many people used to fetch and carry water from these pumps, generally in pitchers. These articles made of earthenware or `CLOAM` were nearly as heavy empty as filled. There were three pumps in Meneage Street but I cannot remember the one at the end of St Michael`s Terrace ever used. The other two however, one outside the old Union and the other besides Mr D.L.Gilberts Sports Shop (Bottom of Horse & Jockey), were in constant use. These tall iron affairs would be clanked with a long handle, usually to the accompaniment of violent squeaks and after a few cranks the water would gush out. There was also another half way down Wendron Street. All that now remains are the stones with the channel cut out to allow the waste water to flow into the kennel.